The imaginary line between sound design and music production in terms of process has all but disintegrated in recent years. Arguably, it’s been disintegrating since the very idea of using “non-musical” sounds in a musical context was first introduced by Luigi Russolo in his historic manifesto, The Art of Noise (1913). Pierre Schaeffer’s concept of musique concrète and John Cage’s music and his essay, The Future of Noise – Credo continued to push the envelope and gave validity to further experimentation. 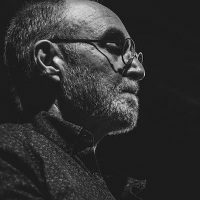 Having been in the mindset that any sound can be “musical” for some time, the division between sound designer and composer appears arbitrary at best. If there is a distinction, it seems tied to the task at hand, rather than the process itself. If I’m designing a sound that simulates the impact of a bullet entering a plank of wood, most people would call that sound design. If I use that same sound as a sort of crunchy snare or layer it beneath a kick for extra bite, I’m a music producer. So once you accept all sounds as possible musical content, it’s a natural step to use “sound design” tools in the production process. It then follows that using music production tools in “non-musical” or unintended ways could yield exciting and unexpected results as well. Below is a list of software (in no particular order) that can be used in both musical and so-called sound design contexts. This list is by no means exhaustive and I encourage comments and additions. The Weaponizer by Krotos Audio, as the name implies, is the ultimate tool for designing sounds for video games or films where such sounds are needed. You can craft a weapon sound asset from the ground up by layering up to four samples from a vast and searchable library for each of the temporal stages of the sound using four engines referred to as: Onset, Body, Thump and Tail. 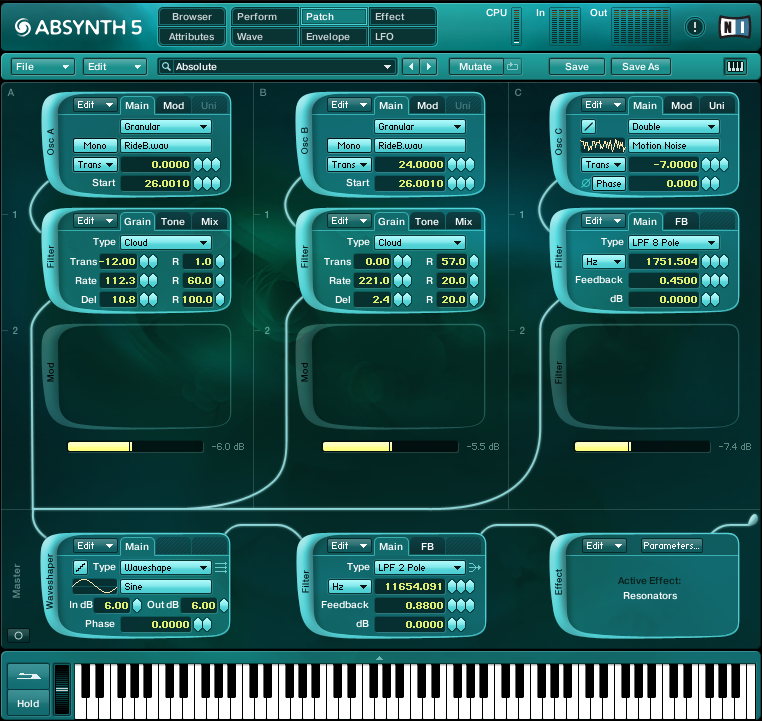 The Onset, Body and Thump modules all include synth modules that can augment the sample or be used independently, while the Tail engine allows access to a convolution reverb. Each has an independent effects chain that can include: EQ, Limiter, Saturation, Ring Modulation, Flanger, Transient Shaper and Noise Gate. It’s sort of a self-contained four channel DAW intended to create everything from aggressive firepower to crunchy impacts and whizzing projectiles. 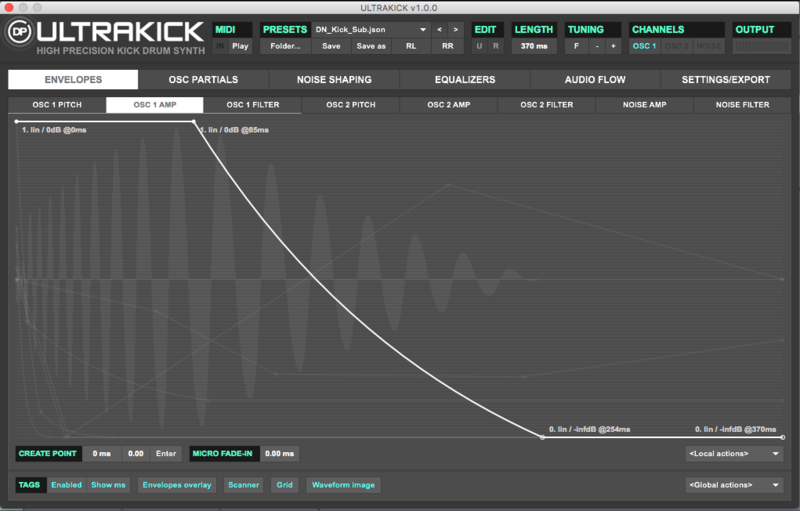 It terms of sound design for gaming or action films this plugin is an obvious choice. But as the developers point out, this plugin can be used by music producers to create drum sounds using the same well-designed engines. Each stage can be triggered independently via MIDI or as a single event. I’ve always believed that many Foley and FX sounds work beautifully in a musical and rhythmic context, and that their spectral richness and inherent rhythmic complexity is underappreciated. The Weaponzier is the perfect software bridge between the worlds of sound effects and music production offering producers an elegant means to expand their sound palette. View a great video demo by the developers below. I also suggest having a serious look at the Dehumanizer and Reformer plugins by Krotos Audio in exploring sound design tools for musical applications. 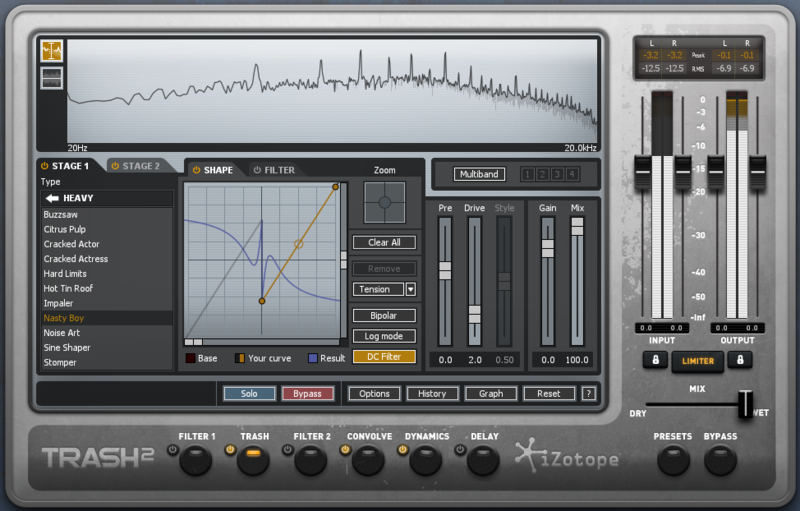 Trash 2 by iZotope is the ultimate mangler that takes distortion and saturation to a new level of mayhem. This thing is addictive and will destroy whatever enters its signal chain in surprising and unusual ways sure to delight even the most demented noise-aholics. Using various filters, LFOs, envelopes, wave shapers, impulse response files, multiband dynamic processing, delay and distortion algorithms, the user can craft the distorted sound of their dreams (or nightmares). The plugin features sophisticated visualizations and metering giving the user the necessary relevant audio and visual feedback for creating well-crafted sounds with healthy dynamic levels. There is a fantastic collection of general presets organized under the categories: Aggressive, Classic Textures, Edge, Experimental, Heavy, Percussive, Subtle, and Utility. Filter and Wave Shaper presets are also available to help you get started. The developer humbly opens the manual with the understatement: “iZotope Trash is a plug-in designed for adding distorted character to audio tracks.” This is like saying an electric guitar is used to play rock and roll. Trash 2 is like the vintage Strat of distortion design. I consider it a must-have plug that’s more like an instrument than an effect. Video walkthrough below. 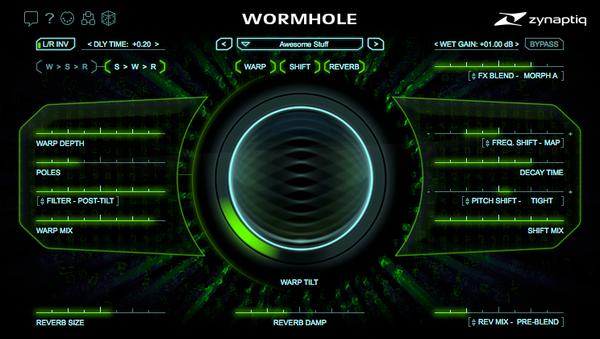 Wormhole by Zynaptiq is a multi-effects plugin capable of “glassy ambient octave-shift tails, surreal ambiences, starship drones, alien, monster, and robot voices,” and spatial otherworldly effects usually only possible via complex effects chains. The developers use a combination of unique spectral warping, rich reverb algorithms, pitch shifting and morphing to enhance sustained sounds creating lovely evolving soundscapes or adding variety and complexity to rhythmic content. The interface is elegant and visually stunning, reminiscent of Adaptiverb, the company’s stellar spatial processing plugin which I reviewed last year. Wormhole makes delicious sounds right out of the box, a perfect mechanism for awakening the hidden sounds lying dormant in the spectral content of existing material. Apple’s Logic Pro remains probably the most awesome DAW on the market in terms of price. The absurdly cheap $199 tag gets you a ton of virtual instruments ranging from the basic ES-M monophonic synth to its flagship instrument, Alchemy. Originally developed by Camel Audio in 2009, this instrument alone is worth the price of Logic Pro. It features an efficient searchable preset matrix for finding a sound quickly based on intuitive tags and user-defined search terms. The performative morph pad allows instant access and seamless transitioning between preset variations. Under the hood are four source modules in which wave generators or even entire EXS24 sampler instruments can be loaded. There is a granular synth engine, complex signal routing and extensive modulation capabilities that include a variety of LFOs, sequencers and multi-segment envelope generators. 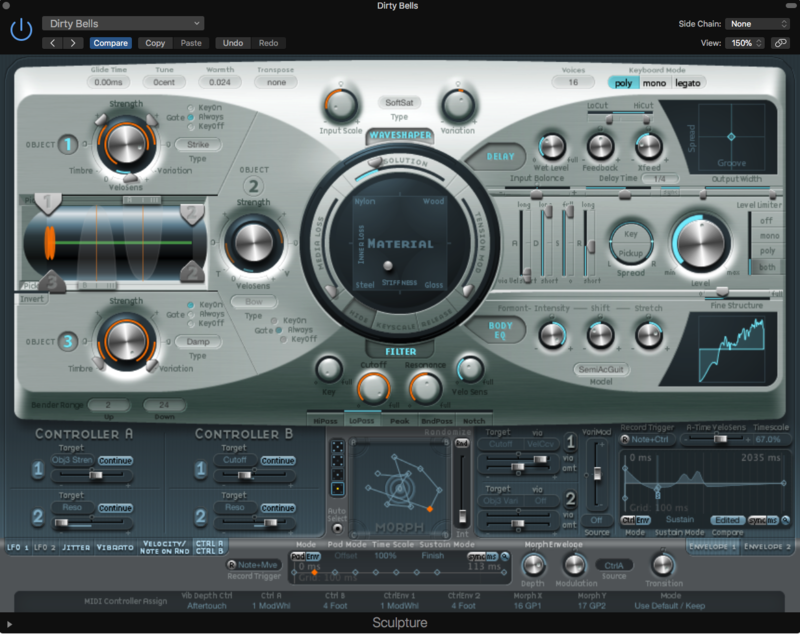 Also notable in terms of sound design in the Logic suite of virtual synths is Sculpture, a full-blown physical modeling synth with a unique morph pad that features a recordable user path. 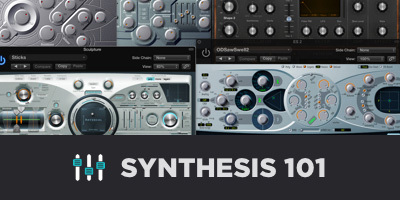 My Synthesis 101 video course features many of the Logic synths as I explore the Fundamentals of Synthesis. 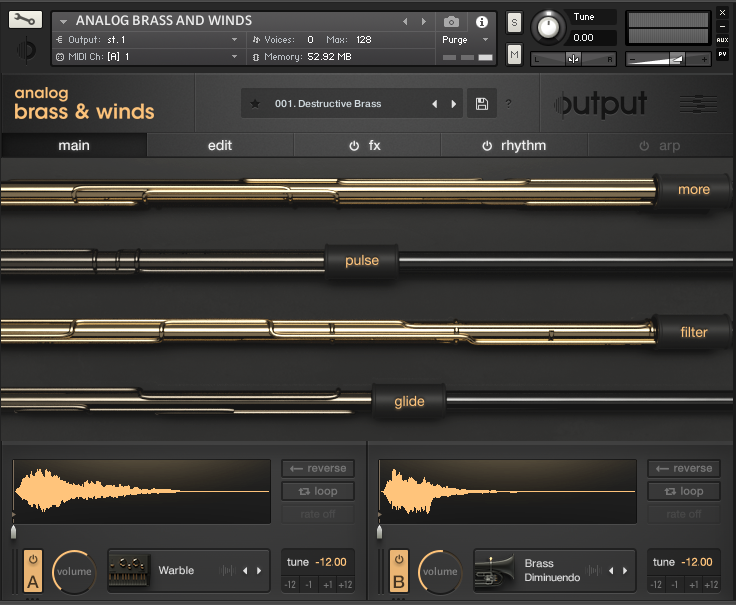 Analog Brass and Winds by Output is their latest entry for the Kontakt-based sampling library sector. I recently reviewed their Analog Strings instrument and this plug is equally impressive. 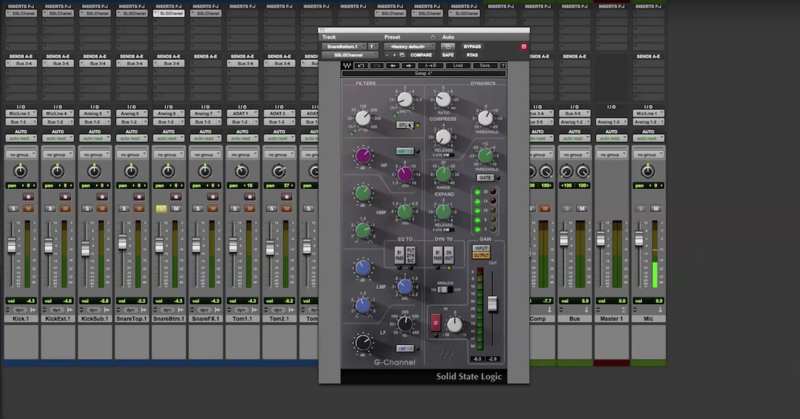 Following a similar aesthetic with four main assignable controls on the front end and two sound sources, the user can sculpt unique sonorities than meld classic brass instrument sounds with vintage analog synth sounds. In addition to the 500 juicy presets available, this instrument is loaded with sound design possibilities and the user is literally a few tweaks away from something truly unique. Most of the samples were recorded in Budapest with an 18 piece brass ensemble and multiple mic positions. The samples were altered with a variety of outboard gear. The Edit page offers control of ADSR envelopes, pitch, flutter options, imaging and polyphony. The FX page offers a complete suite of effects in all the usual categories. The Rhythm page allows for all sorts of modulation including LFOs and sophisticated step sequencers complete will dozens of presets to start with. There are two Arpeggiators for creating melodic and harmonic movement. This thing produces sounds that are brass-like or wind-like, but not in the sense of cheesy synths or bad samples. These are unusual hybrid sounds that retain the flavor and character of the actual instrument while injecting an electronic DNA into their essence. Very unusual and as close as any sample library can get to being a straight up sound design tool. Demo below. After the release of Analog Strings and this latest product, I’m seriously hoping for something along the lines of Analog Mallets. What say you, Output? Native Instruments produces well-designed plugins with solid implementations that have become entrenched in the virtual instrument and effects market. 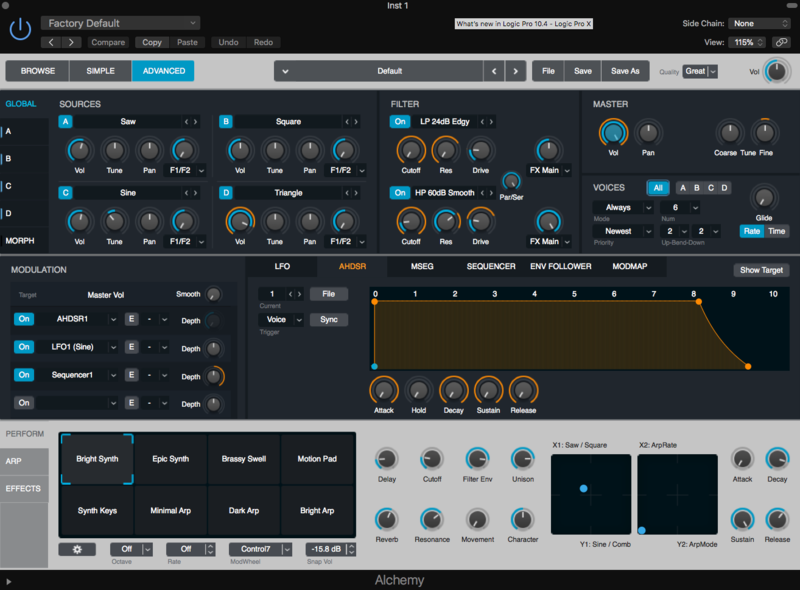 Three that stand out specifically are Kontakt, their sampler platform, Absynth, a semi-modular virtual synth great for producing evolving soundscapes and Reaktor, a multi-faceted instrument based on a graphic-object modular design. 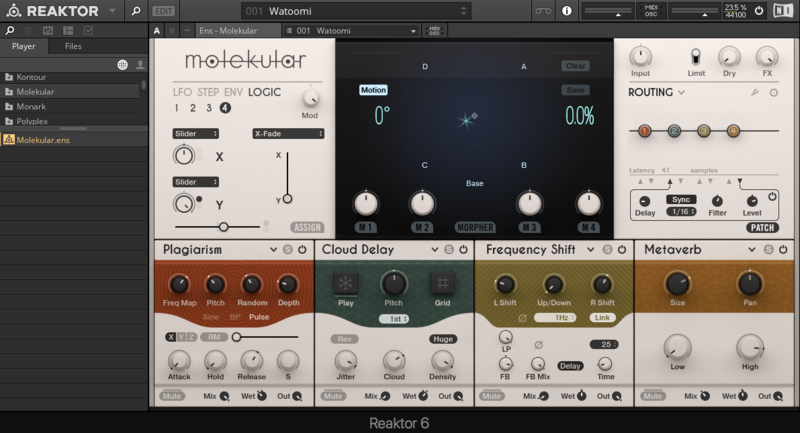 Both Kontakt and Reaktor share the concept of custom scripting or programming as a means of creating unique instruments and interfaces by 3rd party developers or individual users. Kontakt, in particular, has spawned an enormous number of unique libraries and interfaces. The ability of 3rd parties to design interfaces and integrate their ideas has led to most sample library companies offering Kontakt versions of their instruments. 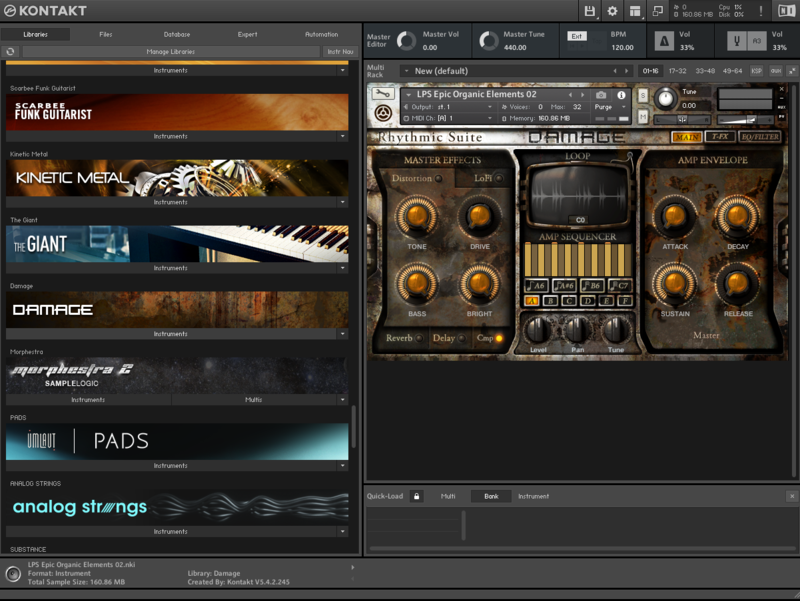 The free Kontakt player can be used for many of the instruments. But most releases require the full version for full functionality. If you’re interested in using samples in any capacity as a producer or composer, Kontakt is a must have since it is required to access to the majority of available libraries on the market. 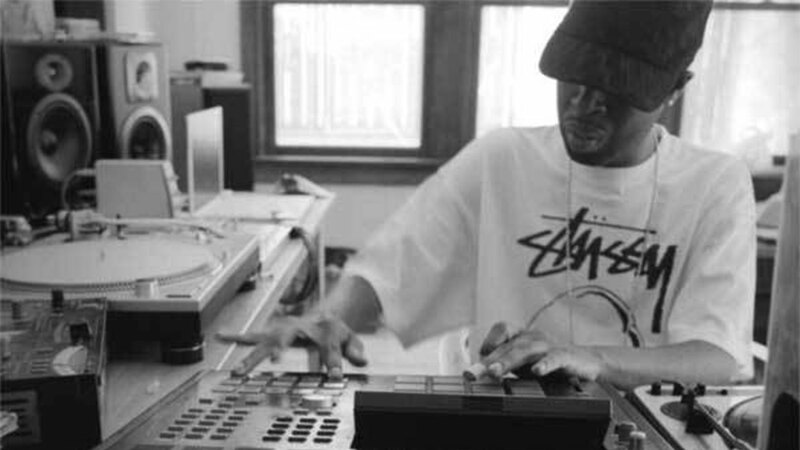 And if you can learn your way around under the hood, you will gain complete access to the sample engine allowing for modulation and processing possibilities perfect for sound design. 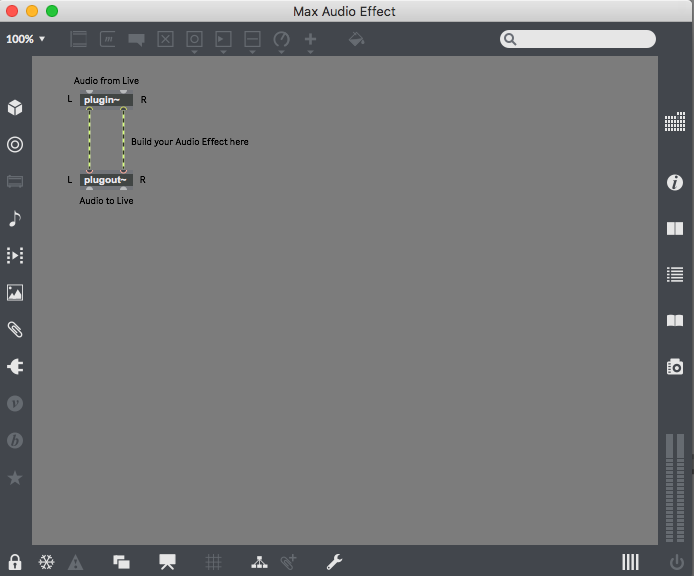 The integration of Max/MSP and Ableton allows 3rd party developers to create Max for Live Devices, so anyone that knows Max can become a plugin developer. 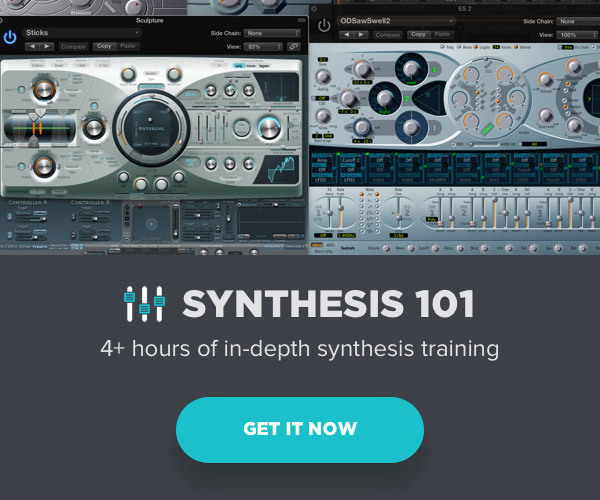 This has resulted in the creation of hundreds if not thousands of unique plugin effects and instruments that range from the quirky and marginally useless to some of the most innovative approaches to sound design and manipulation available. 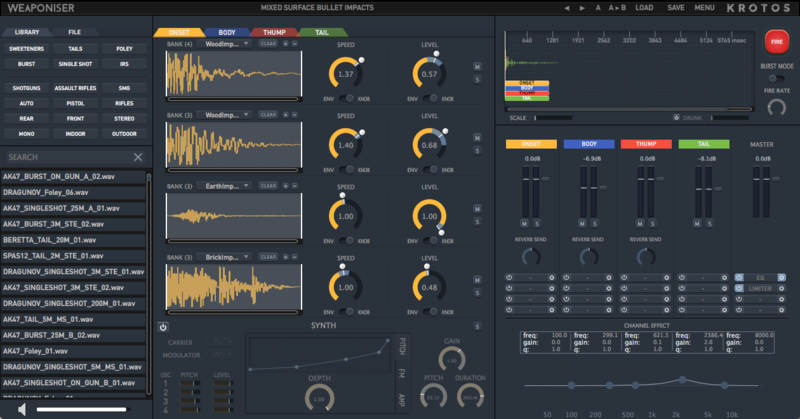 K-Devices offers several M4L devices worth looking at including the recently released Moor, a very unusual step sequencer and Twistor for creating modulation madness. isotonik studios represent a group of M4L developers that have released a slew of solid devices with unique functionality. Read my recent review of ULTRAKICK. 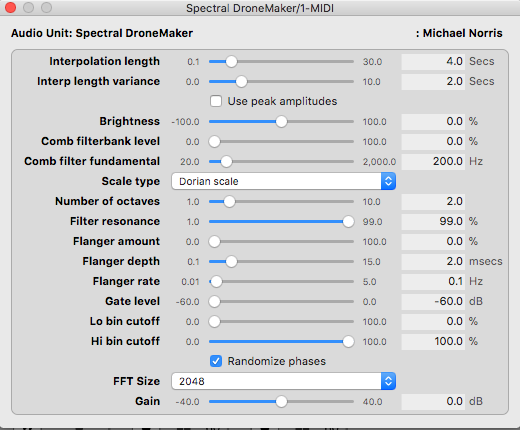 Soundmagic Spectral by Michael Norris is a freeware suite of 23 AU plugins that use real-time spectral processing to create myriad evolving ethereal soundscapes and granulated goodness. It is astounding and admirable that Michael Norris has continued to update this comprehensive collection which is now 64-bit and compatible with MacOS 10.6 or later. They are bare bones in terms of interface, using default sliders and controls for AU plugs, but are capable of fantastic results. Do not underestimate these humble plugs. Sometimes the best things in life are free. 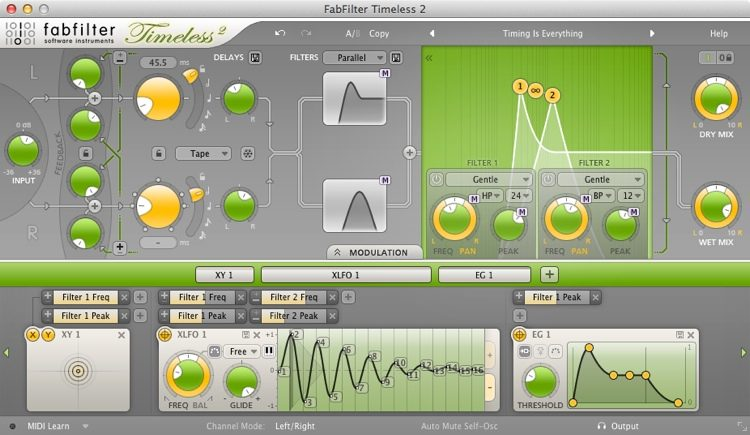 Timeless 2 by FabFilter is just one example of how this company has maintained the same high quality and elegant interface design with their creative plugins that have made their EQ and Dynamic suite of processing effects so revered. Have a look at my overview of their subtractive synth, Twin 2. Timeless 2 is not your ordinary delay. The Filtering and Modulation capabilities set this effect apart from the rest. This video by the developer demonstrates some nice implementations of Modulation routing, Envelope following and Filtering. If you’re looking for a unique approach toward delay processing, Timeless 2 is a great choice. It will lead you to places you never imagined. Please excuse the incompleteness of this list. It is not meant to be comprehensive at all, but simply a quick survey of some of the software that I have found indispensable and particularly well-suited for creating unique sound design for music production. Some obvious omissions are Omnisphere by Spectrasonics, Serum by Xfer Records and the venerable Soundtoys suite of effects to name a few. All great tools that have been written about extensively.